British Airways was out and proud celebrating diversity and inclusion at one of the UK's largest pride events on Saturday in the seaside city of Brighton. 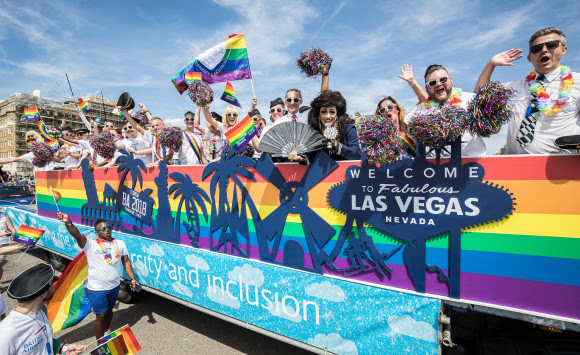 The airline is sponsoring the Pride parade and festival in support of the LGBT+ community, with employees from across the airline joining in the celebrations and manning the company's float. It's estimated that over 300,000 people have descended upon the city for the fantastic festival of colour with much singing, dancing and smiling as The Pride Community Parade made its way from the seafront up to Preston Park where the spectacle continues throughout the afternoon and into the early evening. The BA float was no less spectacular, carrying staff and drag queens and adorned with silhouettes of some of the landmark cities the airline flies to as well as fitting in with the Colour Your World festival theme. Flying Proud is British Airways’ network for LGBT+ colleagues, with over 500 members across BA covering all parts of the airline and global operation. The mission is to create an environment where everyone can truly be themselves whatever their gender identity or sexual orientation.